OOS online as of 3pm EST. Should be in store as well. Please note that the weekly ad this week incorrectly has the full game (Xenoblade Chronicles 2) as $19.99 (it is actually $49.99). It might be able to be price matched at Target customer service or perhaps another retailer that does price matches. 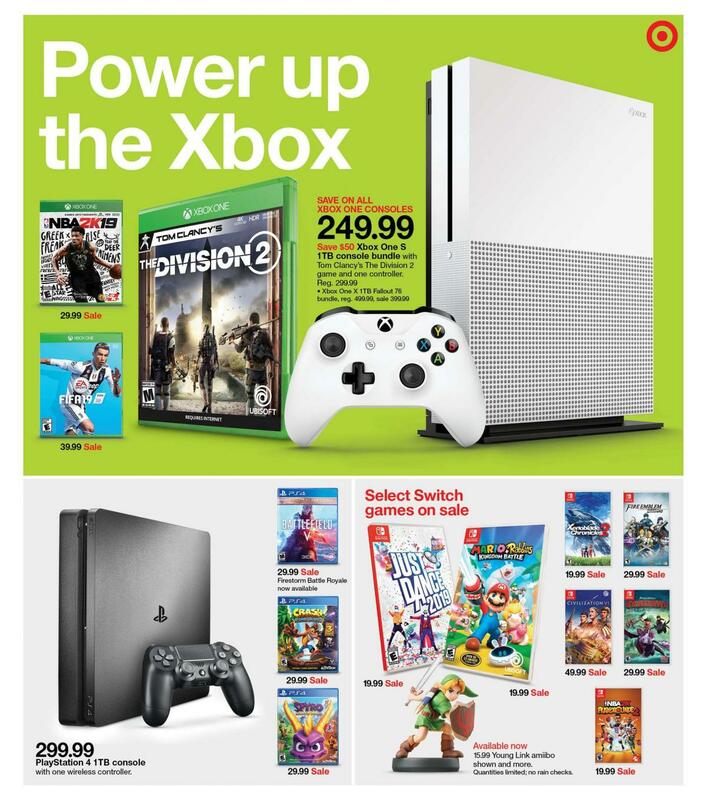 Edit: Looks like Target may have corrected the online ad for the main game for $19.99. Still, the expansion at $19.99 is a great deal. I priced matched in store 2 hours ago for the original game no problem. Thanks OP, I didn’t see it this morning so they must have just updated. I picked this up from Best Buy last week so I’ll either have them price match or return it. $40 for both games... damn good price. The main game was advertised at $20, the dlc physical copy I don’t think is advertised at all. Is it only the physical ad? I didn't see it on the online one. The physical ad actually omitted this page and the online ad has been updated in the last hour to reflect that Torna should be $19.99 rather than the main game. Thanks for the info on Target correcting the ad. Updated the OP. In other words: it's going to be tougher to try and pricematch the full game for $19.99. On the other hand, I was just able to retroactive pricematch the Torna DLC I picked up at BestBuy this past week - no need for a return/rebuy. That ad was not pulling up for me this morning and I got shot down pretty swiftly in electronics and again at customer service. Changed my home store to a different zip code (10001; Manhattan, NY) and the 40 page digital ad turned into the 47 page ad (with the Xbox, PS4, and Young Link amiibo). Pulled it up for the next closest store and they matched it right away. Update: Looks like they've killed it. New ad shows Torna in it's place, as everyone has mentioned. For anyone who doesn't know, this DLC can be played as a standalone title. It comes with a code for the remaining supplementary DLC that applies to the base game. Got both for $20 each. If you have an image of the original ad, its easier to price match but still ymmv. Online ad changed in the middle of me trying to pm in store. They were willing to do the original game for $30 (50% off the in store price), but I said no thanks. Picture of main ad, where I was getting the main game price of $20 and not the dlc copy. Any chance they'll just do a bundle at some point and then I can wait further for a discount on that? I have my doubts considering is it’s own standalone cart and basically a standalone game. But anything could happen. I got the base game on Black Friday and haven't played it yet. What are the chances the expansion will be cheaper than $20 with GCU? Anyone able to pm at Best Buy? I have a page opened with the main game being advertised but the Targets by me are extremely stingy at customer service. Every place I price match at wants a link to the website. Even in store. I've never been able to PM off a screen shot. Been able to do a PM off a picture of an in store walmart price..
Well YMMY as always but there isn't even a date on the screen shot provided so I think it would be difficult to use it is all I am typing. Looks like online is now OOS. Definitely YMMV on the main game. I called the Target in Oro Valley, AZ to check if they had any in stock. As soon as I mentioned the game, the guy on phone said that they were not honoring the $20 price because according to him the ad was "a fake that had been photoshopped by someone on Reddit." When I told him that I had a screenshot from the Target site, he said it had to be live on the site. Called a Target on the south side of Tucson right after that. They were really chill about honoring the price and set a copy aside for me. bummer about the Ad mistake, i was going to get a copy today when i picked up my toilet paper. Bright side is i can wait till tomorrow to go pick up the TP now. I purchased in store pick up 2 days ago. I canceled in store pick up at the guess service and say the game is on Sale today for $20. She knew about it and she manually adjust down $20. Also, picked up DLC version as well. Good day. Since storyline wise this is a prequel, will it have the ramp built into it to help new players out, or does it expect everyone that plays it to have the core game? Only Target I could go to before work only had the expansion in stock & marked properly & now the online ad is corrected with physical copies not having that page? It doesn't really hold your hand like the base game does, so there may be a little hump in learning how to play. Or you can just set auto-battle on. I got this last week at BBY with the sale and GCU, so I could do an adjustment - probably won't tho.